The key to memorable public speaking engagements are excellent speech introductions. An introduction is the section people will remember most about the speech. For example, when you think of the Gettysburg Address, you probably think of the words "Four score and seven years ago," part of Lincoln's introduction. This was so powerful, other public speakers - including Martin Luther King Jr. - used the format in their own speech introductions. Your introduction should establish the tone for the entire speech to come. If you are working with a persuasive speech, and your goal is to ignite the passions of audience members, then you need to start igniting those passions from from the introduction. Otherwise, you will likely lose your audience before you've even started! Your speech introductions should be concise and short, but there are several tasks you need to accomplish before you can safely move on to the body. 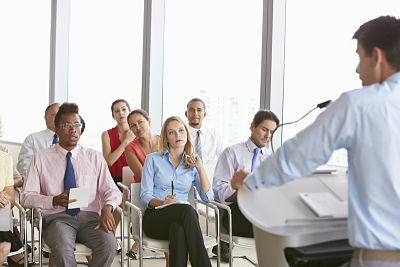 Your first introductory task is to get the audience's attention. You need to capture their hearts and minds and convince them to listen to you for the duration of your speech. Tell a quick story that relates to your topic in some way. Make sure that it both engages audience members and paints a clear picture for them to visualize. Ask audience members a rhetorical question. This will get them to think about your topic without actually requiring them to put forth an answer. Deliver some shocking statistics to make them sit up in their seats. Keep in mind, though, that your statistics should not only be factual, they must also have some measure of impact for audience members. Use a bit of humor. A joke in good taste that relates to your topic is a great way to help the audience stay with you. Once you have the audience on your side, you are ready to issue your thesis statement. A thesis statement is like a contract with your audience members. It tells them exactly what your topic and speech purpose is. It offers them a preview of information to come. Make sure that your thesis statement has a prominent place in your introduction, as it is something you truly want audience members to think about. At some point during your introduction, let your audience know why your topic is important to them. You must adapt your ideas to the needs of your audience. For example, if you are speaking to a group of high school seniors about why the army should increase its minimum standardized test scores for admission, tell the students why they should care about your topic. You will include various measures of adaptation throughout your speech, but it is very important to let audience members know at the start of your speech how the material applies to them. Tell audience members why you are uniquely qualified to speak to them about your given topic. Audiences must know why they should believe you, and giving them some type of credibility statement will help put their doubts to rest. Finally, offer a clear, logical transition to the body of your speech. You must prepare the audience for the details related to your topic, and a strong transition will help to do this. Good speech introductions really are worth the time and effort it takes to create them. After putting lots of work into writing the body of your presentation, you want to make absolutely sure that you hook the audience from the start... and have them listen to every skillfully crafted word! Effective Speech Writing - How to Keep Your Audience Hooked!